To be creative is to be alive, and to have one space in your home where your creative spirit can flourish is a dream to many. In today’s post, I share three style-filled creative spaces designed by designers: Susan and Katharine Hable, Suzanne Kasler and Leslie Moore. 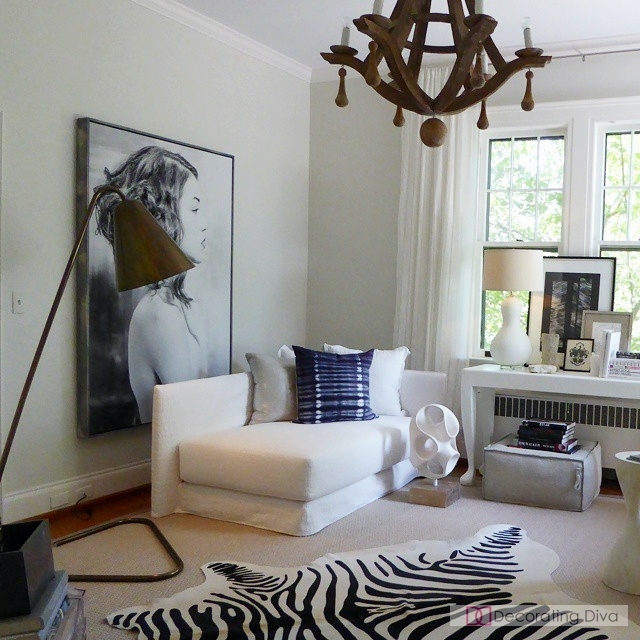 Each space is different and appeals to different artistic and creative personalities. From an orange-infused creative corner to a quiet crafting sanctuary to a sunny, color drenched artist’s loft. Each offers a unique place for creativity to come play. 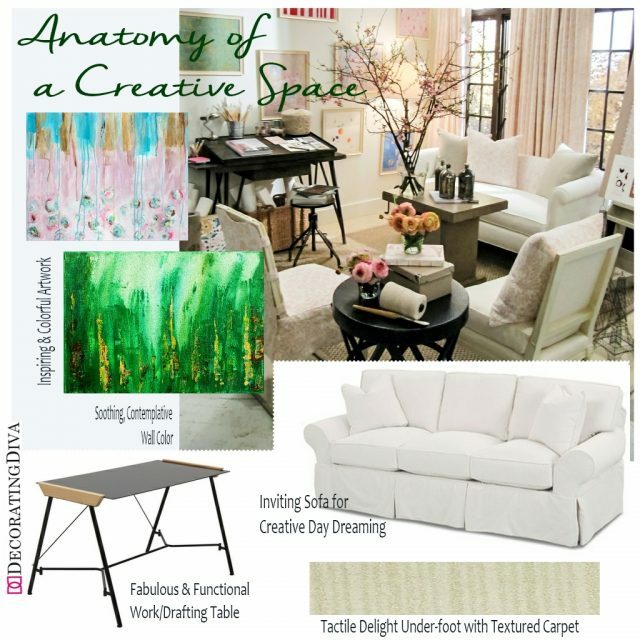 I hope these places inspire you to create your own creative room at home, and with that in mind I break down the principle elements of each design to show you how you can create these magical spaces in your home. Get the creative juices flowing with splashes of high-energy orange – a color most associated with creative personalities. The fresh orange hue combined with a bold, inspiring fuchsia are sure to keep your creativity going all day long. Opt for durable performance fabrics for your upholstered pieces – so no worries if you drop paint or other crafting materials on your favorite chair. 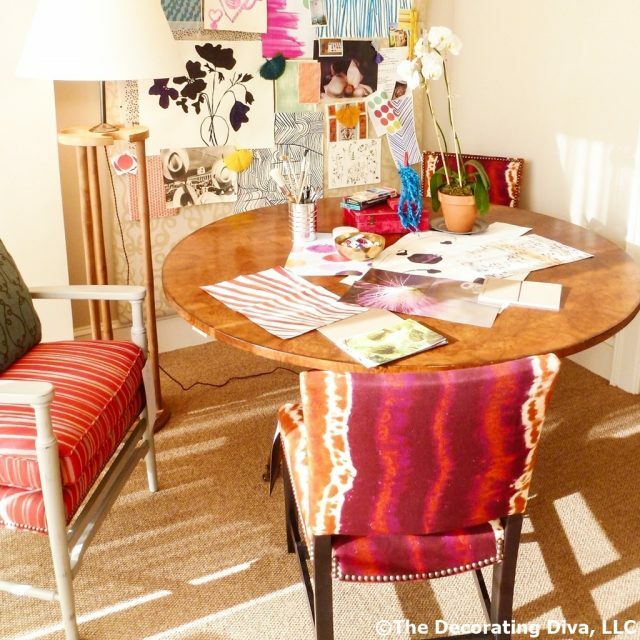 A large round table makes crafting, moodboard scheming and design dreaming so much easier. And don’t forget to add a super-comfy carpet so even after a day of creative-making your feet will feel like you’ve been cloud-walking all day long. Creative Space Design Inspiration: Designed by Susan and Katharine Hable of textile design firm, Hable Construction. 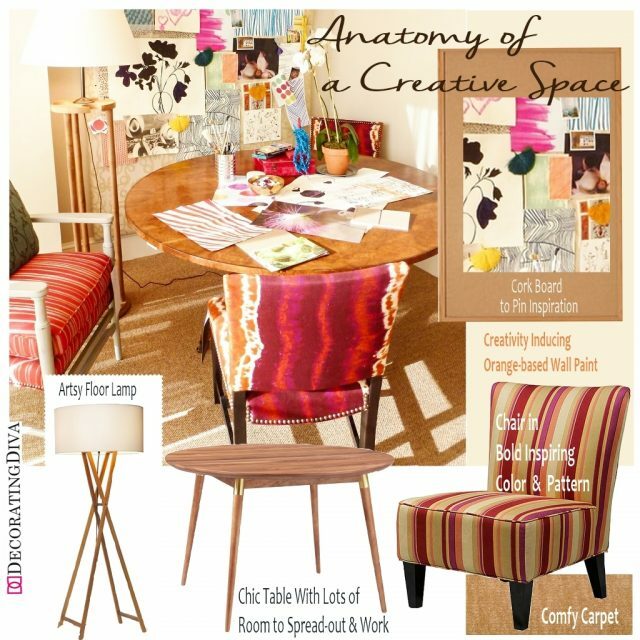 Design Board Details: “Cala” Floor Lamp by Joan Gaspar, from Marset – Ylighting, “Savannah” 46″ round dining table in natural finish – One Kings Lane, Portfolio “Hali” striped wine armless designer accent chair – Overstock.com, Cork Board – Office Supply Store, “Icehouse Lake” carpet in “Accent” by Bigelow– Carpet One Flooring & Home. When crafting or being creative is your retreat from the chaotic world around you, treat yourself to a creative space that indulges your senses and transports you into a world of peace and tranquility. Select calm, soothing colors coupled with classic neutrals, add touches of inspiring muted color through meaningful art displayed in gallery form, make room for a comfortable sofa to warmly embrace you while your creative spirit is renewed, and when your feet touch the ground let them be met by the gentle massage of textured carpet under-foot. 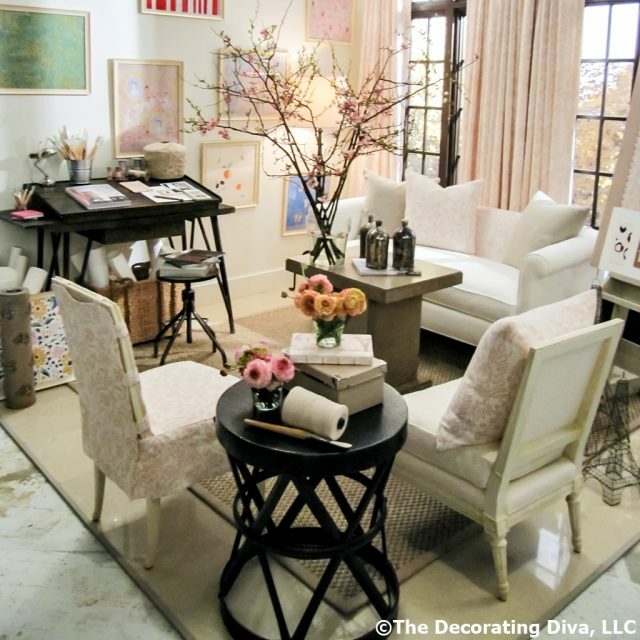 Creative Space Design Inspiration: Designed by Suzanne Kasler. Design Board Details: Commissioned contemporary abstract floral art by Modern Muse Art – Etsy, “Urban Work” contemporary artwork – Lucas Abstract, Calico Designs “Futura” Black Work Desk – Overstock.com, “Casey” sofa in custom upholstery – Wayfair.com, and “Picturesque” carpet in “Mansion” by Bigelow– Carpet One Flooring & Home. Bright, happy, and brimming with the optimism and joy that comes from taking a color-saturated brush to canvas, the cheerful artist’s loft is filled with hues reminiscent of Vincent van Gogh’s portraits of southern France. Walls dressed in the golden tones of ochre are complimented by inspiring art pieces in complementary colors of blues and greens. A cheerful pale yellow, gingham patterned mid-century modern wingback chair invites the artist to sit back and enjoy the gallery wall filled with their artwork or read their favorite art book. Being the ever stylish artist, a chic brass geometric-patterned bar cart hosts art brushes, palettes, mixing trays and a variety of oil paints. Not far from the bar cart stands a painter’s easel acquired on a trip to the famed artist enclave of Montmartre near Paris. 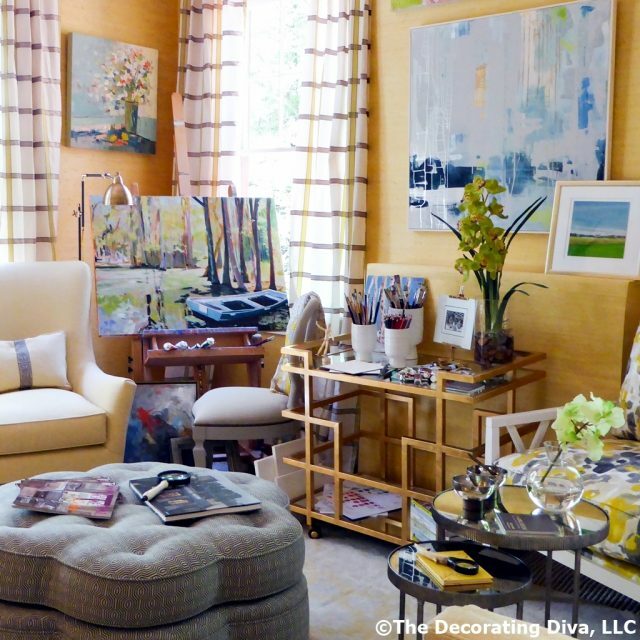 Creative Space Design Inspiration: Artist’s loft designed by Leslie Moore. 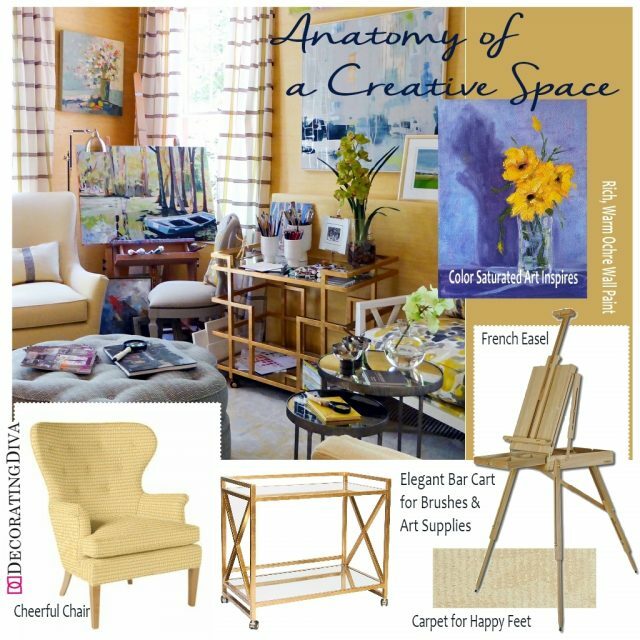 Design Board Details: “Tulla” upholstered wingback chair – Maine Cottage, “Gerard” brass bar cart – Worlds Away, “Mirlago” in “Graphic Art” by Bigelow – Carpet One Flooring & Home, “Sunflower” still life oil painting by Nancy Merkle – etsy.com and French-style artist easel – Art Stores.